To understand the ecological characteristics of floating mat in which endangered species of Iris laevigata and Menyanthes trifoliata inhabit, we surveyed the vegetation and water environments of a floating mat wetland and examined the relations between ecological characteristics of the mat. Although Phragmites australis and Zizania latifolia were found at all experimental quadrats (n = 61) as the major vegetational components of the floating mat wetland, they showed relatively poor growth performances in terms of shoot height (< 2 m) and biomass production (< 300 g/m2) compared with those in soil-based wetlands because of oligotrophic water condition. 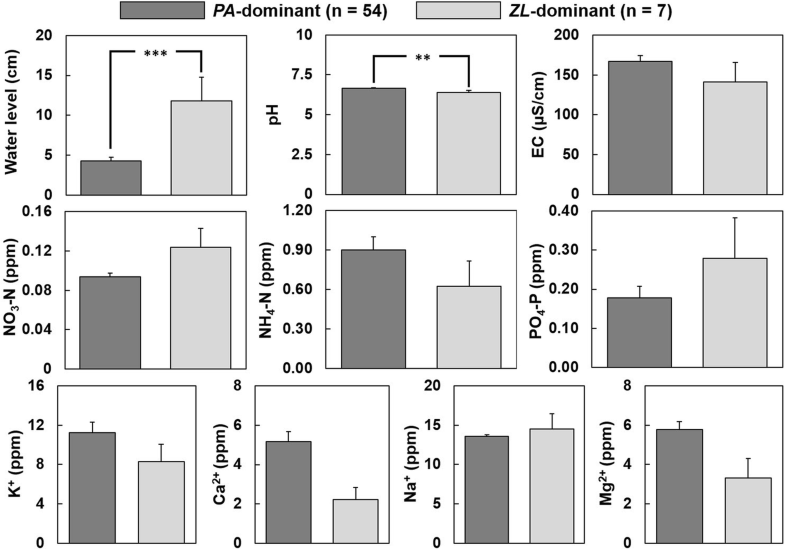 The competitiveness and distribution of P. australis and Z. latifolia seemed to be determined by water level difference by micro-topography rather than water chemistry. P. australis and endangered plant species mainly occurred in the area of relatively shallow water, whereas Z. latifolia and deep-water species such as Scirpus fluviatilis mostly inhabit in the area of deep water on the floating mat. Continuously maintained water level and oligotrophic water condition in the floating mat appeared to be important environments for endangered species such as I. laevigata and M. trifoliata. Common reed (Phragmites australis [Cav.] Trin. ex Steud.) and wild rice (Zizania latifolia [Griseb.] Turcz. ex Stapf) are representative emergent macrophytes that play an important role as major vegetational units in wetland ecosystems (Asaeda et al. 2005; Hung et al. 2007). P. australis and Z. latifolia show high competitiveness in wetlands within shore areas of downstream, ponds, and lakes because both species are able to grow at the height of over 3 m in canopy with dense stands and to rapidly expand particularly under low-velocity flow or lentic conditions (Hong and Kim 2014; Hong et al. 2014; Byun et al. 2017). Rapid growth and expansion of P. australis and Z. latifolia in wetlands are based on the vigorous below-ground system. They usually invest a higher ratio of resources into below-ground parts when compared with other macrophytes in terms of biomass allocation under low-nutrient condition (Hung et al. 2007; Hong et al. 2014). Below-ground parts of well-ventilating tissue, aerenchyma, not only supply oxygen but also make wetland plants likely to float in wetlands. Thus, vigorous below-ground parts possibly enable P. australis and Z. latifolia to form floating mats making them to have a high tolerance to inundated condition (Cherry and Gough 2006). With vigorousness in growth and expansion, those species often exhibit monotypic occupation in wetlands threatening the biodiversity, whereas they occasionally make floating mats functioning as habitats for other species particularly in deep-water wetlands or lakes (Haraguchi 1991; Tuboi and Hussain 2018). It has also been noted that floating mats could be adequate habitats for weak competitors, including endangered plant species such as Cicuta virosa L. and Menyanthes trifoliata L. (Kim et al. 2013; Shin et al. 2015). In this study, we tried to focus on a floating mat mainly composed of P. australis and Z. latifolia in a coastal lagoon, Sunyoodam, Korea. It has been reported that the floating mat functions as habitats for endangered plant species such as M. trifoliata, Iris laevigata Fisch., and Nymphaea tetragona var. minima (Nakai) W.T. Lee and animal species, such as Kaloula borealis Barbour (Kim et al. 2013). Although the floating mat appeared to play an important role as a biotope for endangered species in Korea, only few studies on the floating mat have been performed so far. In particular, the ecological characteristics of the floating mat focusing on major vegetational components of the mat have not been investigated yet. In this study, we surveyed the vegetation and water environments of the floating mat and examined the relations between the ecological characteristics of the floating mat. We also sought the applicability of floating mats as useful habitats for endangered species. The study site located in a freshwater coastal lagoon, Sunyoodam (38° 21′ 25.7″ N, 128° 30′ 14.7″ E), of 17,061 m2 in area, which has been isolated from saline water exchange by the construction of embankment in Gangwon Province, Korea. Water sources of the lagoon were the inflow from the surrounding watershed including mountainous areas and paddy fields as the major and rainfall as the minor. It has been reported that the mat consisting of living and dead plant materials had a varying thickness ranging from about 20 to 60 cm, and peat formation in the lagoon has not been reported (Kim et al. 2013). Most parts of the lagoon except the northern area separated by a dike were filled with a floating mat mainly composed of P. australis and Z. latifolia (Fig. 1). Open-water areas were maintained along the boundaries between the floating mat and the lagoon for irrigation use. In addition, two endangered plant species of Korea were partly distributed in the lagoon. Most populations of I. laevigata were found on the floating mat, and the others were in the northern area separated from the floating mat by the dike. M. trifoliata populations were mainly found in the southwestern part of the floating mat (Fig. 1). In order to understand the ecological characteristics of the floating mat focusing on the vegetational components and water environments, a total of 61 quadrats of 1 m2 were placed randomly on the floating mat at intervals of about 6~7 m in the growing season (Fig. 1). Assuming that both P. australis and Z. latifolia would be observed in all of the experimental quadrats as the major vegetational components of the floating mat, the experimental quadrats were classified into two groups in terms of vegetational coverage (> 50% in coverage) in the field: P. australis-dominated and Z. latifolia-dominated quadrats. where y is the above-ground dry weight (g), and x is the shoot height (cm). The regression analysis was performed by using statistical software, SPSS package for Windows (IBM SPSS Version 20.0, New York). As the minor vegetational components, all companion plant species including the endangered species were also recorded. Physical (water level from the mat surface and electric conductivity [EC]) and chemical environments of water (pH, NO3–N, NH4–N, PO4–P, K+, Ca2+, Na+, and Mg2+) were investigated. The physical components of water were measured at the study site. The water level was measured from the mat surface with a wood stick ruler. EC (Corning Checkmate model 311; Corning, USA) and pH (model AP 63; Fisher, USA) of the water were measured by using portable meters. A total of 61 interstitial water samples (1 sample per quadrat) on the floating mat were carried to the laboratory in Seoul National University and filtered by using nitrocellulose membrane filter (0.45 μm) for chemical analyses. NO3–N, NH4–N, and PO4–P concentrations were analyzed by the hydrazine method (Kamphake et al. 1967), indophenol method (Murphy and Riley 1962), and ascorbic acid reduction method (Solorzano 1969), respectively. Cations (K+, Ca2+, Na+, and Mg2+) were measured by using an atomic absorption spectrometer (model AA240FS; Varian, USA). To examine the differences between ecological characteristics and the relations between ecological characteristics of the floating mat, t test and the correlation analysis on all the data of the ecological characteristics were performed by using statistical software, SPSS package for Windows. Phragmites australis and Z. latifolia were found at all of the quadrats (n = 61) as the major vegetational components. Shoot density, coverage, and AGDW of those two species except shoot height were statistically different at the quadrats of each group (P. australis-dominated, n = 54; Z. latifolia-dominated, n = 7). Each dominant species showed approximately twice higher values of shoot density, coverage, and AGDW than the counterpart species. Shoot height of P. australis was about 1.5 m, whereas that of Z. latifolia was around 1.0 m throughout the floating mat (Fig. 2). Most of the environmental characteristics of water chemistry including NO3–N, NH4–N, PO4–P, and cations did not show any significant difference between the two dominant groups. In the floating mat, EC values were around 150 μS/cm, and NO3–N, NH4–N, and PO4–P concentrations were lower than 1.0 ppm. Most concentrations of cations were also lower than 10 ppm except Na+ ranging from 7.6 to 21.2 ppm (Fig. 3). On the other hand, those two groups statistically differed in water level and pH (Fig. 3). In particular, water depth in Z. latifolia-dominant quadrats (11.8 ± 7.2 cm) was more than twice as deep as P. australis-dominant quadrats (4.3 ± 3.6 cm). All of the endangered species, I. laevigata (24.1%) and M. trifoliata (11.1%), were recorded in P. australis-dominated quadrats, and they were not observed together in a quadrat. The growth status of major vegetational components and water environments of the quadrats in which the endangered species was observed did not show a significant difference compared with those in the P. australis-dominated quadrats (Table 1). In addition to the endangered species, Polygonum thunbergii Seibold & Zucc. (75.4%), Carex heterolepis Bunge (57.4%), Persicaria muricata (Meisn.) Nemoto (24.6%), and Bidens frondosa L. (13.1%) were also recorded as minor vegetational components. C. heterolepis was observed only under the canopy of P. austrlias, whereas the greater part of Scirpus fluviatilis (Torr.) Gray was found under the canopy of Z. latifolia (Table 1). N. tetragona var. minima, one of the endangered plant species that was reported to inhabit in the lagoon (Sunyoodam), was not found via our investigation. Most values in terms of growth performance such as shoot height, density, coverage, and AGDW of the major vegetational components (P. australis and Z. latifolia) were significantly correlated with each other. All values of P. australis were positively correlated with each other, whereas shoot height was negatively correlated with density (Pearson’s r = − .408, p < .01) and coverage (Pearson’s r = − .305, p < .05) in Z. latifoila. On the other side, the density of Z. latifolia was negatively correlated with density (Pearson’s r = − .270, p < .05) and biomass (Pearson’s r = − .294, p < .05) of P. australis (Table 2). The shoot height of P. australis (Pearson’s r = .459, p < .01) and density (Pearson’s r = .394, p < .01) and coverage (Pearson’s r = .417, p < .01) of Z. latifolia were significantly correlated with the water level as a physical characteristic of water environment, whereas most of the values in terms of growth performance did not show significant correlation with chemical environments including NO3–N, NH4–N, and PO4–P (Table 2). Micro-topography is of importance in terms of habitat heterogeneity for biodiversity. In wetland ecosystems, water level difference by micro-topography as a physical environment is the most influential factor in determining vegetational components and subsequent biodiversity (Park et al. 2013; Nam et al. 2014; Byun et al. 2017; Kim et al. 2017). In our study, water level difference rather than water chemistry appeared to determine the vegetation of the floating mat (Table 1). Although both P. australis and Z. latifolia were found at all quadrats of the floating mat as the major vegetational components, they showed higher competitiveness at different environments in terms of water level. 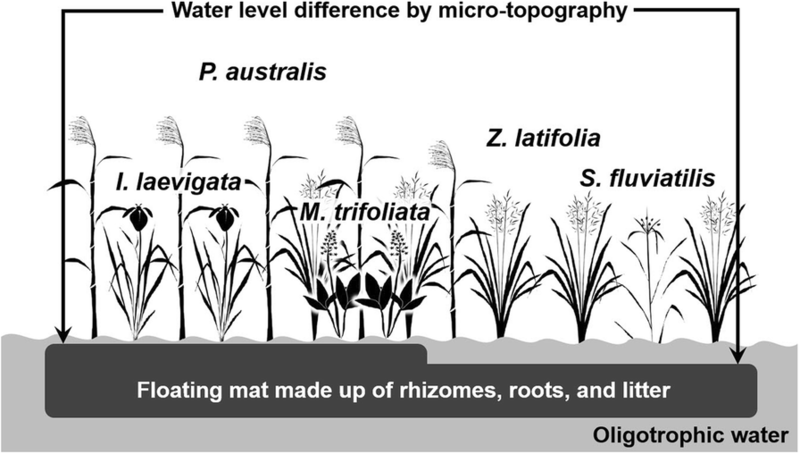 Phragmites australis was the predominant species in most parts of the floating mat of the relatively shallow area, whereas Z. latifolia was dominant under deeply inundated area as a deep-water species (Hung et al. 2007). Water level difference between stands of P. australis-dominated quadrats and Z. latifolia-dominated quadrats has reached up to over 20 cm in some areas (data not shown). In addition, it seemed likely that the distribution of companion species was also subjected to the difference in water level. Polygonum thunbergii, C. heterolepis, and the endangered species as shallow-water species were mainly found under the canopy of P. australis (Kim et al. 2013; Lee et al. 2018), whereas the greater part of S. fluviatilis as a deep-water species was observed in company with Z. latifolia on the floating mat (Yuan et al. 2007). In wetland ecosystems, plant species diversity usually decreases with the increase in nutrients because of the monotypic occupation by strong competitors such as P. australis and Z. latifolia particularly under eutrophic conditions (Hong et al. 2014; Byun et al. 2017). Thus, wetland ecosystems with the flora of high diversity containing weak competitors such as endangered species tend to be formed under oligotrophic conditions (Hong and Kim 2013; Hong et al. 2017). In our study, the floating mat also appeared to be an oligotrophic habitat. Not only the level of nutrients in water such as NO3–N, NH4–N, PO4–P, and cations but also the growth status of the major vegetational components (P. australis and Z. latifolia) indicated the oligotrophic condition of the floating mat. In particular, both P. australis and Z. latifolia generally grow to over 3 m in canopy height with dense stands (> 2000 g/m2) in soil-based wetlands on the land (Hong and Kim 2012; Hong et al. 2014). In our study, however, they showed relatively poor growth performances in terms of canopy height (< 2 m) and standing crop production (< 300 g/m2), possibly explaining the co-existence between strong and weak competitors on the floating mat. Although we could not understand the formation process of the floating mat in detail, it seemed likely that both P. australis and Z. latifolia could importantly contribute to the formation process at different times. As a deep-water species, Z. latifolia might form the mat of a sparse structure as the early stage of mat formation in a deeply inundated environment (Yamasaki 1981). After that, P. australis might make the mat more buoyant and stable by adding a large volume of below-ground parts such as rhizomes and roots as the late stage of mat formation (Hung et al. 2007; Hong et al. 2014). In fact, according to the report by Kim et al. (2013) focusing on the M. trifoliata in Sunyoodam lagoon, it seemed likely that P. australis contributed to making the floating mat thicker by vigorously developing below-ground parts. In this study, the water level difference by micro-topography on the floating mat could be the result of temporally different contributions of Z. latifolia (the early stage) and P. australis (the late stage) in the formation process of the floating mat. Most parts of the floating mat appeared to be in the late stage of mat formation except some boundary areas of relatively deep water in which Z. latifolia mainly occurred. Although the floating mat covered most parts of the lagoon as the late stage of mat formation, Z. latifolia was observed together with P. australis at all quadrats in spite of possible interspecific competition between those species that have been abundantly reported particularly under eutrophic conditions (Yamasaki 1984; Hung et al. 2007). In our study, the reciprocal repression between P. australis and Z. latifolia seemed to be slight or none. Rather, those two species appeared to complement each other as the major components of the floating mat under oligotrophic condition (Kim et al. 2013). The fact that endangered species were found in the floating mat may not mean that the floating mat has provided optimal environments for those species. Rather, it might indicate that the floating mat has offered relatively better environments for those weak competitors when compared with the growth in the wetlands on the land because of decreased competitive pressure as a result of the oligotrophic condition of the floating mat (Shin et al. 2015; Lee et al. 2018). In addition to the oligotrophic condition, continuously maintained water level on the floating mat regardless of varying water level in the lagoon could also be a favorable environment for endangered species to germinate, grow, and establish stably (Cherry and Gough 2006; Shin et al. 2015). Artificial floating islands (AFIs), which are artificial floating platforms vegetated with wetland plants, have been abundantly utilized in many countries (Pavlineri et al. 2017). Although AFIs have several ecological functions such as water purification, habitat supply, shoreline erosion protection, and landscape enhancement, most cases of AFIs have been mainly utilized as water purifiers for mitigating eutrophication particularly in Asian countries such as China, Japan, Korea, and Taiwan (Lee et al. 1999; Yao et al. 2011). Based on the floating mat in our investigation as a benchmarking model, we suggest that the role of AFIs as an alternative habitat for weak competitors such as uncommon and endangered species should be addressed particularly under oligotrophic conditions (Shin et al. 2015). We also recommend selecting appropriate component species for AFIs such as P. australis and Z. latifolia that invest more energy into the below-ground parts for stability as a floating mat (island) and making up micro-environments in the water level for biodiversity as a more valuable ecosystem (Fig. 4). Unlike other types of wetland ecosystem, too little attention has been paid to floating mats in Korea in spite of the high potential in various applications. There have been only few studies on floating mats, and those studies have focused on ecological characteristics of floating mats such as vegetation, water chemistry, and physical structure of mats at a point in time. To understand floating mats in detail for various and wide applications, further studies on changes in biogeochemistry (i.e., nutrient dynamics) and vegetational components (i.e., succession process) of floating mats based on time series analysis are needed. This research was supported by the Basic Science Research Program through the National Research Foundation of Korea (NRF) funded by the Ministry of Education (NRF-2015R1D1A1A01057373) and National Research Foundation of Korea (NRF) grant funded by the Korea Government (MSIT) (NRF-2018R1A2B2002267). MGH designed the study and wrote the manuscript draft. BEN participated in the field works. JGK conceived the study, participated in the design of the study, edited the manuscript draft, and secured the funding. All authors read and approved the final manuscript.